The first thing to do when dealing with sewer pipes is to distinguish between rigid pipes and flexible pipes. Rigid pipes are pipes whose ring section cannot undergo horizontal or vertical deflection without the pipe being damaged. However, flexible pipes are pipes where an external stress may cause deflection of the ring section >3% without damages. The deflection, whether on a short or a long term, can reach higher values without damages or signs of failure on the pipe structure. 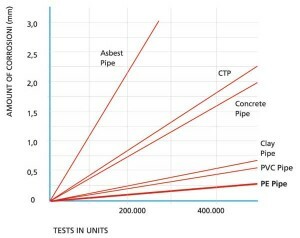 The key parameter of flexible pipes is ring stiffness, which depends on both geometrical fat (moment of inertia of the wall) and on the characteristics of the material (module of the elasticity). 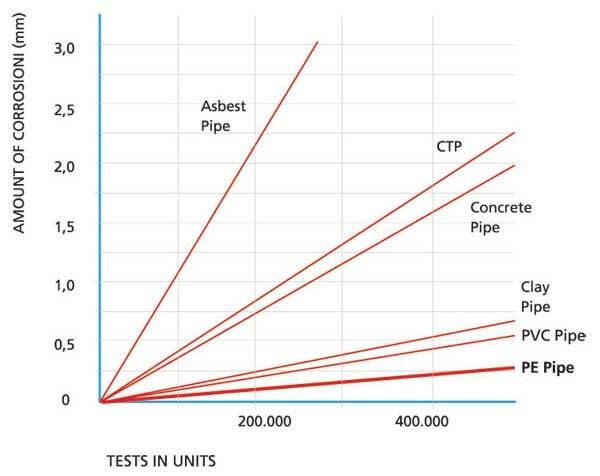 To ensure highest quality and longest lifespan of the pipes, it is of high priority to attain high chemical and wear resistance as presented In the graph (above/below). Chemical and Wear Resistance PDF Table.